This piece, called Sensuous Beauty, was created by artist Melodie Douglas. Abbotsford artists are opening their studios to the public on Saturday, April 26 as part of a new tour. This Art Studio Tour – in celebration of BC Arts and Culture Week – is brought to the public by the Abbotsford Spirit of BC office which seeks to promote local artists, educate all who come, and make art accessible to everyone. The Art Studio Tour will provide a rare opportunity for visitors to interact with the artists and see their artwork at the source – the artist’s own studio. The event stats at Kariton Gallery at 11 a.m., and continues via a guided bus tour where art enthusiasts will be given a behind-the-scenes glimpse into artists’ creative worlds. Tours include transportation, guided commentary and finally a reception to delight your senses provided by: Lotusland Vineyards, ChocolaTas, Tega Red Tea Infusion, Birchwood Dairy’s Inc. and Tanglebank Country Gardens. Participating artists are: Gwen Gregorig, Stella Johnson, Irene Enns, Norm Williams, Robert Williams, Melodie Douglas, Christopher Friesen, Neil Lowen and Bente Hansen. Tickets are $10 and can be purchased by calling Sherry at the Abbotsford Spirit of B.C. office 604-850-7161. Seating for this event is limited. One of the nine artists involved in this tour is Melodie Douglas, a self taught artist born and raised in the Fraser Valley and currently residing in Abbotsford. She started developing her artistic skills in 1995 when she was introduced to decorative art and tole painting. From there she went on to open up a painting studio/retail store, where she taught various techniques related to decorative art using acrylic paints painted on furniture, metals, canvas, glass and candles. Wanting to develop her skills further she took various drawing classes at UCFV both in graphite and charcoal. 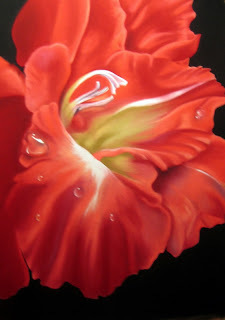 Her current medium of choice is soft pastels, which she first started in 2005. She immediately was hooked on the medium, both for the ease of use, beautiful vibrant colors and the ability to manipulate the paint with a simple swipe of color. Also participating in the tour is valley artist Christopher Friesen. Born in Chilliwack, Friesen now considers himself to be from Abbotsford. Friesen is now a painting professor in visual arts at UCFV. “I believe that Abbotsford will in the future become a place of culture, it has been a long up hill battle with getting the arts in Abbotsford recognized but with new facilities and a new visual arts building that now offers a BFA degree, Abbotsford should start to see more artist start to stay instead of move away,” he stated.